The FC5 Purifying Cleanser & Toner- What Arbonne has to say about it: "Lightweight formula cleans and tones, visibly reducing oiliness to help keep skin looking young, fresh and clean." Of all of the products here I think this is probably the one I like best. It does a great job of cleansing my face and is easy to use at the end of the day and aids in my face makeup removal. The only downside here is that it definitely tends to dry out my skin if I use it more then once a day. That's where the next product comes in handy. The FC5 Oil Absorbing Day Lotion Broad Spectrum SPF 20 Sunscreen- What Arbonne has to say about it: "Lightweight moisturizer helps absorb oil and filters UV rays to help prevent sunburn, leaving the skin with a fresh, matte appearance." My oily t-zone sure appreciates a moisturizes that isn't too heavy and this one not only smells good but also keeps my skin hydrated after using a drying cleanser. Protecting my sensitive skin from the sun is another excellent perk. The FC5 Mattifying Powder- What Arbonne has to say about: " Translucent Oil Absorbing Powder takes away unwanted shine while reducing the appearance of redness for a perfect matte finish." I really enjoy the effects of dusting this over my face makeup with a large fluffy brush to set it all in place. It not only keeps my makeup from moving around but also helps keep my oily t-zone looking matte and also blurs out imperfections, creating an airbrushed look. Makeup Primer- What Arbonne has to say about it: "Luxurious makeup primer visually diminishes fine lines and pores, creating a canvas for flawless makeup application"
This one reminds me of one of my all time favorites, the Smashbox Photo Finish Primer in it's consitency and feel. It's silky and smooth and definitely ensures my makeup staying put throughout the day. Primers like these also help create a base for my foundation aiding it in sliding right on effortlessly. 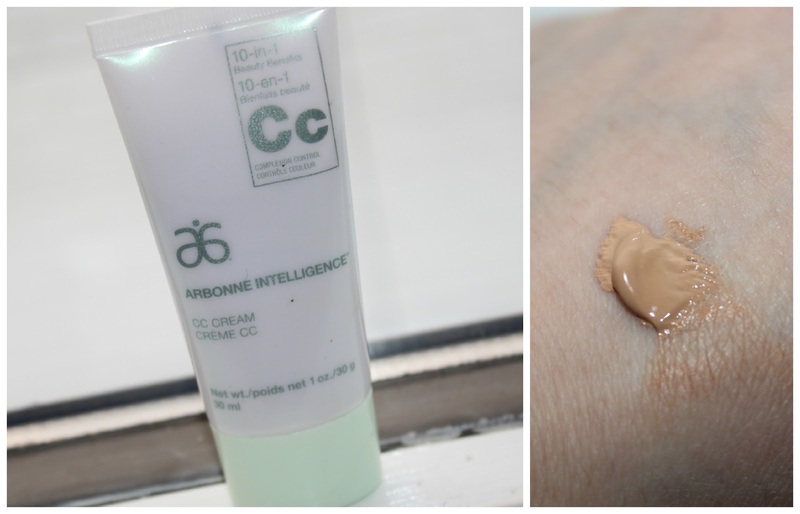 Arbonne Intelligence CC Cream- What Arbonne has to say about it: "In just one week, dramatically improve the look and feel of skin with out 10 in 1 complexion control cream." I've never been a real fan of cc creams, they always seem a bit thick in consistency for a face product, I definitely favor tinted moisturizers. The color didn't match me perfectly too so that could be a factor in what was throwing me off initially. That being said, I do like using this in combination with my Stila All Over Shimmer Liquid Luminizer (review coming soon). This helps thin it out a bit making it easier to blend over my face. It has sheer to medium coverage if you build it up and it does last nicely throughout the day as well. It's A Long Story Mascara- What Arbonne has to say about it: " High Performance lengthening mascara helps create the look of ultra dramatic lashes with major longitude. Clinically tested and formulated to be water resistant and long wearing"
The shape of the brush on this mascara is surely quite unique. I don't think the thicker, larger square end was completely necessary since it just gets in my way but otherwise it gets into the roots of the lashes easily coating them from root to tip. The formulation didn't give me seriously voluminous are lengthened looking lashes but I do definitely like wearing it for a more natural every day look. I am impressed with the way it lasts on my eyes without smudging or flaking at all throughout the day.